Let’s face it: paper parking coupons are a pain. From scrounging around to find one in your car to accidentally punching out the wrong date, there are many things that drivers in Singapore love to hate about this decades-old system. The good news is, paper coupons are a special kind of pain. “This is a very pertinent, concrete and well-defined pain point for the public that we can address,” said Mr Li Hongyi, deputy director, product and engineering at GovTech. And address it they did—Mr Li and his team at GovTech developed Parking.sg, an app that liberates you from paper coupons, letting you pay for parking through your mobile device instead. Made with the support of the Ministry of National Development (MND), the Urban Redevelopment Authority (URA) and the Housing and Development Board (HDB), the app went live in October 2017 to mostly positive reception. Speaking at the Public Sector Infocomm Seminar on 20 March 2018, Mr Li took the audience through the app’s development journey, detailing his team’s thought processes, challenges faced and lessons learned. If you weren’t there, we’ve got your back—read on for a behind-the-scenes look at how Parking.sg went from prototype to production. “Our team’s job is to actively identify, design and evangelise ideas that improve the public good,” said Mr Li. This means that when the team has an idea, it often dives straight into building a prototype rather than first pitching it to higher-ups and waiting for their go-ahead, he added. The first working prototype of Parking.sg was “as bare bones as you can get,” consisting only of an ‘enforcer app’ that checked pictures of licence plates against a manually edited database. At this stage, something rudimentary will suffice; concerns like polishing, scalability, maintainability and analytics can be addressed later on in the development timeline, said Mr Li. To develop a concrete proposal for building the app, developers must get to a version that can be tested on actual users, who can then provide early feedback on what works and what doesn’t, said Mr Li. For example, one of the team’s original ideas was to incorporate computer vision into the app, allowing parking enforcement officers to snap a picture of a licence plate and have the app determine if its driver had paid for parking. But after shadowing an experienced officer, they realised that she was so good at reading paper coupons that it took her just seconds to figure out whether a driver had overparked—in other words, much faster than any computer vision solution they could code. The team ended up finding a not-so-fancy but much more effective way of speeding up enforcement: by listing the licence plate numbers of cars with valid parking, so that officers could simply walk down a road and pick out which vehicles were not on the list. What finally got Parking.sg off the ground had little to do with the app’s design or utility; instead, the trigger was the government’s December 2016 decision to increase public parking charges, said Mr Li. Drivers were unhappy not only about the price increase, but also about the inconvenience of having to switch to the new 60-cent paper coupon denomination. 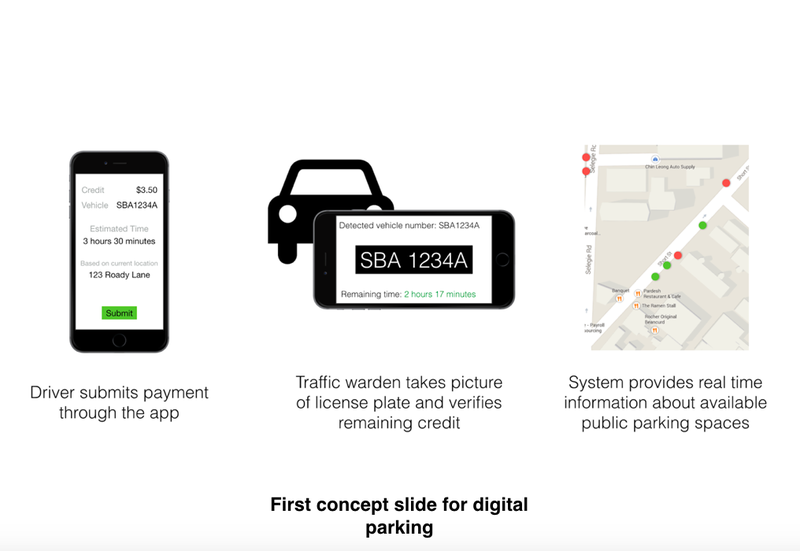 At this point, the relevant government agencies, who already knew about the Parking.sg prototype from talks with GovTech, asked the team if it could develop the app for public use. “We were ready to push the project live,” said Mr Li, noting that the team’s preparation had paid off.